In late 1995, earth moving equipment moved in to clear coastal shrublands on Korella street reserve. However, the Friends of Korella Bushland gained the support of the city of Joondalup for one oval to be constructed and the remaining three hectares of bushland to be conserved for passive recreation and wildlife. Fences and paths were constructed to control access, so that the bushland would not become further degraded. Signs were erected to recognize the group ‘Friends of Korella Park Bushland Regeneration Project’. Since 1996 work in the bushland has included weed eradication,revegetation, seed collection and the removal of litter, rubbish and grass clippings.Other activities include information displays, monitoring the bush regeneration, writing reports and submissions for funding. Perth’s bushland is unique and special. 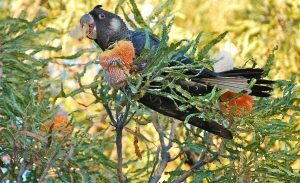 Bushland is important for biodiversity (endangered s Carnaby’s Black Cockatoos often visit Korella Bushland) as well as for our lifestyle. It needs to be cared for. Introduced plants, weeds, animals and diseases, trampling, fires and pollution degrade our bushland.